18 years after the Satellilte of Love fell out of orbit on SyFy at the end of its 10th season, Mystery Science Theater 3000 returned with 14 new episodes and a new cast on Netflix, following a highly successful Kickstarter campaign led by series creator Joel Hodgson and new series owners Shout Factory. Those 14 episodes have now arrived in a complete season set on Blu-ray. Run Time: 21 Hr. 0 Min. In the not too distant future…. In the eighteen years since the final episode aired, rumors would fly around the internet that MST3K would be returning in one form or another. I never quite believed them, mostly because Mike Nelson was having great success with RiffTrax, a podcast of sorts where Mike and his fellow riffers from MST3K (Kevin Murphy and Bill Corbett) released commentary tracks to all sorts of movies, from cult classics, total dogs, and current blockbusters. The tracks were so successful that movie labels such as Kino began including them on some of their cult classic Blu-ray releases (The Incredible Two-Headed Transplant) and have their own “channel” on Pluto-TV. In 2015, Joel Hodgson and Shout Factory were able to acquire the rights to produce new episodes from the original rights holders, and in turn launched a Kickstarter campaign to help fund the new episodes. When the campaign ended, more than enough money was raised to produce 14 episodes. It was decided that a new cast was necessary to continue the evolution of the show, as well as a higher production value. Jonah Ray, a comedian and podcast host, was brought in as the show’s new host, Jonah Heston. He would be joined by Tom Servo and Crow T. Robot, now voiced by Baron Vaughn and Hampton Yount respectively. Kinga Forrester (Felicia Day) and Max aka “TV’s Son of TV’s Frank” (Patton Oswalt) would be the ones subjecting Jonah to the bad movies. I have mixed feelings about this incarnation of the series. Jonah Ray is very likeable and a worthy successor to both Joel and Mike. It took some getting used to the new voices of Crow and Servo, but after a few episodes they grew on me. Oswalt is perfect as the dufus sidekick Max, who we later find out has a crush on Kinga. For me, the jury is still out on Felicia Day as Kinga, who can be nasty but all too often it comes across a bit overly forced. Hodgson has assembled a great team of writers that not only includes the on-screen talent, but also brings back MST3K regulars Paul Chaplin, Bill Corbett, and Mary Jo Pehl for a few episodes, plus Elliot Kalan (The Daily Show), and Erik Marcisak (Far Cry 5). The season also features cameos by Paul Chaplin, Bill Corbett, Mary Jo Pehl, Kevin Murphy, Jerry Seinfeld, and Mark Hamill, to name a few), which varied from fun to somewhat distracting. The 14 movies selected for this eleventh season range from campy fun to completely dreadful, and that is before the riffing. The highlights are Reptilicus (a monster import from Denmark that features a catchy song in a host segment, Every Country Has a Monster, which reminded me of Godzilla Genealogy Bop from season four), Cry Wilderness (Bigfoot helps a young boy find his father who is lost in the woods), Avalanche (a 1970s disaster “epic” from Roger Corman starring Rock Hudson, Mia Farrow, and Robert Forster), Wizards of the Lost Kingdom (a Roger Corman sword and sorcery tale, this season’s Final Sacrifice), The Christmas That Almost Wasn’t (a dim-witted lawyer comes to the aid of Santa Claus who is in a rental dispute with his landlord at the North Pole), and last but not least The Land That Time Forgot and At the Earth’s Core (a pair of Edgar Rice Burroughs epics produced in the mid 1970s by American International Pictures). The Time Travelers, The Beast of Hollow Mountain, Star Crash, The Loves of Hercules, and Yongary are near misses, while Wizards of the Lost Kingdom II and Carnival Magic are either missed opportunities or just poor choices. It should be noted that, despite being made for a streaming service that doesn’t really have time limits due to commercial breaks or timeslots, most if not all of the movies have been edited for time (nearly every episode has a shorter running time than the movie being riffed). Some of the charm from the original series is here, but what really made the series fun was its very low-budget approach, and that is what is sorely missing here. The sets and effects look great, especially in HD and even more so on this Blu-ray set, but wasn’t the whole point of the show was that it originated as a late-night hosted movie program on a low-wattage UHF channel in St. Paul, MN, and much of that was carried over to Comedy Central and SyFy? Season 11 of MST3K makes the jump from 4:3 480i to 16:9 1080p, and the results on this Blu-ray set (using the AVC codec) are exceptional. Compared to the 1080p stream on Netflix, the image is slightly sharper, colors are much more solid and bold, and compression artifacts are greatly reduced (but not eliminated – at least during the movie segments). Two movies, however, have some serious issues with dropped frames, giving them a stuttering quality, almost as if you were watching them online back in the early days of the internet: Star Crash and Carnival Magic. I checked my Blu-ray disc of Star Crash (the movie, not the episode) that Shout Factory released back in 2010, and there were no dropped frame or stuttering issues. Since these issues appear on both the Netflix Streams and the Blu-ray discs of these episodes (and not on the Blu-ray version of Star Crash), this must have been a compositing issue where the movie was sourced from a broadcast master that was created at 30 frames per second and then married to shadowrama material shot at 24 frames and outputted at 24 frames as well. Shout Factory has provided both a 5.1 and 2.0 stereo mix, both encoded in DTS-HD Master Audio. The 5.1 mix is an interesting one, particularly during the movie segments. Riffing has been directed mostly top the center channel, while the movie (all except Star Crash came from mono sources) has been directed to the left, right, and surround channels, simulating how a movie would sound if you were seated in the theater behind Jonah and the bots. Personally, I preferred the 2.0 stereo mix, which places both the riffs and the movie front and center evenly with some minor ambience in the surrounds, providing a more balanced sound overall. We Brought Back MST3K (1080p; 73:16): Unfortunately, the only extra is this excellent documentary produced by Ballyhoo Motion Pictures that covers a briefe history of the series, the resurrection during the Kickstarter campaign, and the making of the new season. 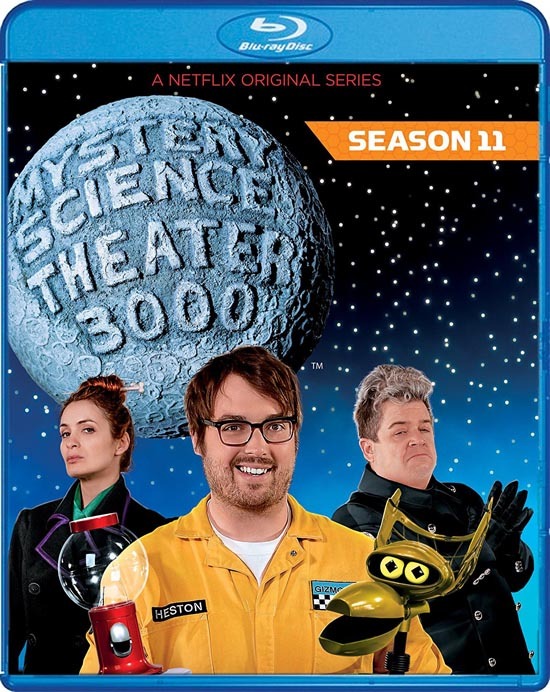 When Mystery Science Theater 3000: The Return debuted on Netflix this time last year, I struggled to get through the first few episodes, and wasn’t very high on my list of shows to binge-watch. The new season has grown on me a bit, warming up to the new cast and finding a few gems along the way. Some may balk at the high price tag of the set, but this is the first time Shout Factory has released an entire season of the series in one box (a total of 14 episodes and a full-length documentary spread over 8 discs). This set is definitely for die-hard fans who want to easily share the season with their friends and for those who subscribe to Netflix and have a sporadic and possibly slow internet connection. Having been a MSTie since the days of Comedy Central, I was pretty 'worried' about how this new series would work out and I was very, very happy with it overall. It'll never be the golden age of Joel again but I thought they did a nice job with the riffs and they managed to pick some obscure and crummy movies that lent themselves to being goofed on. Well seeing as the first year of OG MST3k wasnt that great either I'm willing to give Jonah, Baron, and Hampton more time to get into a groove here. My only problem with the 11th season was how the BEST thing about the "Time Travelers" movie (the ending) was dropped in its riff. No spoilers here but I was waiting to see how they would have handled the original ending (which floored me when I saw it in the theatre in its original release). I have all the box sets and have seen the original broadcasts but not this new one. Will check it out when my local library has it. I thought the riffs were consistently funny, but… and this is the biggest problem I had with the season… there are sometimes too many of them. Especially in the first episode or two, they were babbling jokes so fast that you couldn't process one before it was on to the next. But by the third or fourth episode they seemed to find a better pace. I'm a fan of both Felicia Day and Patton Oswalt, but Kinga and Max just didn't really gel for me. Nothing can compare with the Double Act of Evil, Dr. Forrester and TV's Frank. I like Jonah as host. He's probably my third favorite of the MST3K hosts, but still good. I'll be picking up this set and waiting patiently for season 2. I hope they can convince some of the other old cast members to do cameos this time too. My only bothers with this season is Kings and the Son of TV’s Frank always look like the are just standing in front of a green(blue?) screen. The old eps they clearly were on a cheaply put togther set. Also,all three of them sound too much alike when they are riffing in the movie. I can tell who is saying what. Plus what is Cambot doing when she comes in and moves the box thing that she is uh, moving? That's Gypsy… she's moving the "payload" is what we're told, though what the payload is is a mystery. It's a tethered satellite so I don't know what they could be "moving." But I think these Gypsy scenes are just an excuse to get a female voice in there once in a while. Yeah Gypsy. It’s just odd and feels,out of place. She comes in twice a show and says something that’s supposed to be funny, it’s not and they don’t even acknowledge that’s she’s there.